Clean Energy Fuels Corp. announced that it has been awarded two new fueling station construction projects. 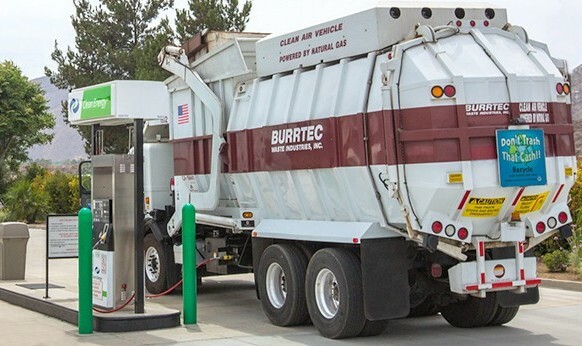 Burrtec Waste Industries, one of the largest private solid-waste companies in California, has contracted with Clean Energy to build a CNG station in Coachella. The station is expected to fuel 50 CNG refuse trucks and dispense approximately 520,000 gasoline gallon equivalents (GGEs) per year. Burrtec also awarded Clean Energy a 10-year operations and maintenance contract for the station. South Jersey Gas and Riggins Inc. have also contracted with Clean Energy to build a public CNG station in Franklin Township, New Jersey utilizing the company’s CleanCNG™ compressors. This will mark the 100th CleanCNG™ non-lubricated compressor with ultra-low vibration and noise-engineering to be delivered since announcing the start of production in June of last year. Clean Energy also signed a 10-year operations and maintenance agreement for the station, which will be the third South Jersey Gas station that Clean Energy has constructed and been engaged to provide the operations and maintenance services for. “While we continue to add transit, trucking and refuse fleets to our list of customers fueling at our network of stations all across North America, we also continue to build complete stations for our customers, and we expect to complete 62 of these types of projects this year,” said Andrew J. Littlefair, president and CEO of Clean Energy. Moreover, Clean Energy’s Facility Modification Services (FMS) division continues to grow with multiple projects underway, including three for Cummins Inc.’s Sales and Service business at their locations in Hodgkins, Illinois; Bristol, Pennsylvania; and Bronx, New York. Clean Energy has been also awarded a contract with the City of San Fernando to upgrade its public CNG station. The $1.3 million project is needed due to the increased traffic at the station, as well as to incorporate newer technologies in compression equipment.